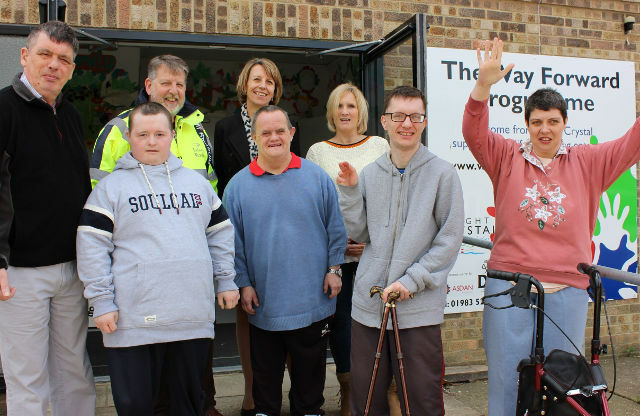 The new doors enable all visitors to the Way Forward’s HQ at Dodnor, particularly wheelchair users, to access the support services of the charity far more easily. A Newport-based charity that helps people build confidence and live independently is literally opening new doors for its users. The Way Forward has just installed new push button accessible entrance doors thanks to a £5,500 grant from Island Roads’ Isle of Wight Foundation. The doors were installed by Wootton-based company, Frontrunner Door Systems, and are already proving beneficial to Way Forward users. “The new doors will be the latest addition to our fabulous Learning Disability day centre in Newport and we are very grateful for the continued support we have received from Island Roads and the Isle of Wight Foundation. “It is great to see the new doors installed which will make it much easier for people to access The Way Forward’s facilities.